Our collection of Tyreek Hill Fantasy Football Names is a quick read just like the player. The fastest player in the NFL made his mark felt as a rookie kick returner, punt returner, receiver and running back for the Kansas City Chiefs. The ultimate swiss army knife of a player, Hill is a dynamic back that can be a game changer in the flash of a few seconds. 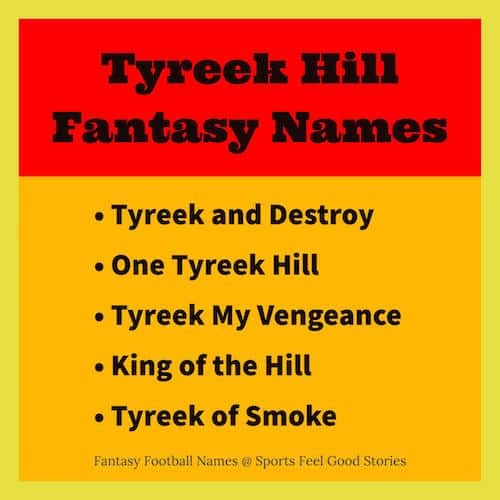 Check out our funny Tyreek Hill fantasy football team names below. Tyreek won both the 100 meters and 200 meters races at the Georgia 5A state meet in 2012. He’s that fast. Predraft, Tyreek ran a 4.29 seconds forty yard dash. That’s fast. Real fast. Tyreek Hill was the first player with a kick return for a touchdown, a rushing touchdown, and TD reception in a single game since the feat was accomplished by Gale Sayers in 1965. Hill was named to the 2017 Pro Bowl Team as a punt returner. He was also a first team All-Pro selection as a punt returner. 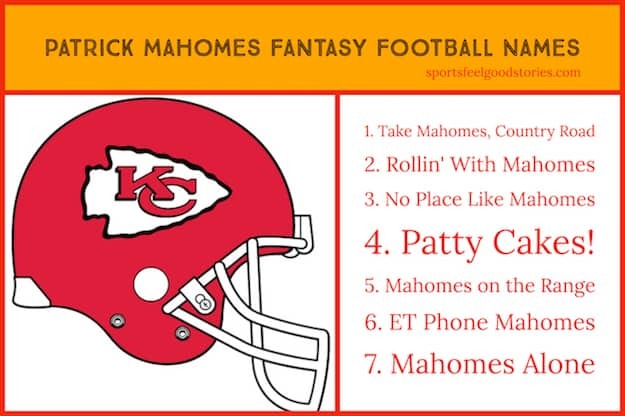 Click on image above for Chiefs Fantasy Football names. With Tyreek, any logo design should probably speak towards his speed. Goodness gracious, he’s the fastest player in the NFL and the logo should reflect that. Our two favorites for name selection are Tyreek and Destroy and One Tyreek Hill. For the latter, you might need to get creative on addressing his speed. If you have any cool or funny Tyreek Hill fantasy football names, please let us know via our Contact page. Thanks! Check out Tyreek Hill on Wikipedia.